We cannot understand the importance of our parks if we don’t understand their history. This article walks us through our city’s first park and its humble beginnings to a growth of urban development leading to large city parks and ending with the affects on our green spaces caused by White Flight. The modern concept for urban green spaces has its origins in 19th century England. The Industrial Revolution started in England during that time, and ushered in an era of urban growth never seen before. England’s population increased significantly from 6 million in the early 1700s to 16.8 million in the mid 1800s. As cities became more crowded and their boundaries expanded, accessibility to the natural environment decreased. Early Victorian landscape designers like Joseph Paxton understood the need for areas of recreation in the city. The early proponents of parks in Britain saw them as ways to increase the economyand community pride. In 1847, Paxton was commissioned to design Birkenhead Park, the first publicly funded park in England. Fredrick Law Olmstead, the father of American landscape architecture, visited the park in 1850 and incorporated many of its aspects in his design of Central Park in 1858. In the 1850s, Grand Rapids was still a frontier town with a population of 2,686 but the lumber industry grew exponentially in the city which produced a thriving furniture industry. By 1890, only 40 years had passed since Grand Rapids became a city and the population had grown to 60,278 and was continuing to increase rapidly. In Albert Baxter’s 1891 book, History of the City of Grand Rapids, Baxter explains that for the city’s size “Grand Rapids has not much to boast of in the size, number or attractiveness of her parks or pleasure ground.” Two of the parks Baxter describes in his book are Fulton Park (Veteran’s Park) and Ball 40 (John Ball Park). The oldest park in Grand Rapids is Veteran’s Park. It was originally established as a public square in 1833. Later it was called âCourtHouse Squareâ and was the site of the first Kent County Court House from 1838 until it burned down in 1844. It was replaced by a smaller structure that was used for court purposes, meetings of the board of supervisors and the site of annual Indian payments. During the Civil War days, stands were erected around which people gathered to hear news from the front and engage in community singing. The park sat as a semi-blighted public space for about 15 years. Eventually, Thomas Gilbert, a prominent businessman and city leader, pushed for the development of the park. He surrounded it with a fence to keep out livestock along with major landscape redevelopment. By the late 1800s it had become a picturesque park named Fulton Street Park that featured benches, walkways and a wooden bandstand in its center which later was replaced by a beautiful bronze fountain. Later, public contributions along with those of the Grand Rapids Council of the American Legionfunded the building of the famous pillars in the park you see today. They were developed to honor the sacrifices of WWI veterans and dedicated on Armistice Day November 11, 1926. In 1927, the park was re-landscaped and the reflecting pool was built. In 1956, the Grand Rapids City Commission changed the name to Veteran’s Memorial Park and more funding was raised to place further war memorials. John and Mary Ball donated 40 acres of their land to the city in 1869. It was originally called the “Ball 40.” At the time, little value was placed on the park development in the city and many aldermen doubted the decision of accepting the land because the acreage was outside the city limits. The Ball 40 became property of the city in 1884 and in 1891 the “zoo” was founded. The zoo’s first attraction was a pair of rabbits and later a pair of owls. All the animals were wild and came on their own accord but were fed with food purchased with city tax dollars. In that first year, two deer were bought by the mayor and alderman, who contributed $25 each out of their official salaries. Later greenhouses, a duck pond, flower beds, a dance pavilion and the city’s earliest outdoor swimming pool was developed in the park. Between 1897 and 1904 the city expanded the Ball 40 by purchasing more acreage which would eventually lead to the park reaching its current size of 140 acres. The greenhouses shared 38,000 plants with developing city parks. 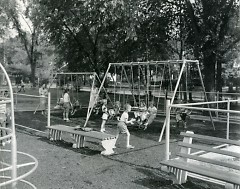 By the early 1900s, the park had become a very popular spot in the city. The superintendent of parks reported that 733,000 utilized the park during that year alone. In the 1890s, the “City Beautiful Movement,” a philosophy of reform that transformed urban planning, began. Architects and urban designers created comprehensive plans for the controlled growth of cities across the U.S. This movement started to influence Grand Rapids at the turn of the century which lead to exponential growth of the parks system. In 1905, an act passed by the Michigan Legislature brought a revision to the city charter that took the jurisdiction of the public parks out of the hands of a standing committee that was part of the common council and into the hands of the Board of Parks and Cemetery Commissioners. That year a young man named Eugene Goebel became Superintendent of Parks and Cemeteries. His work would lead to the planning of theRiverside Park, John Ball Park, and several more of the urban green spaces we enjoy today. Grand Rapids was becoming aware of deficiencies in her park system and in 1909, the Board of Trade (present day Chamber of Commerce) employed John Ihlder to investigate the maintenance and acquisition of park land in western U.S. cities. Tim Gleisener, head of the GR History & Special Collections Department at The Grand Rapids Public Library, explains that Ihlder published several articles in the Grand Rapids Herald about the innovations witnessed in the cities he traveled. By 1911, Grand Rapids expanded its park land from 180 acres to 450, due to the voters passing a $200,000 bond issue. In addition, on August 31, 1911 the new Grand Rapids Parks and Boulevard Association (GRPBA) was organized. The GRPBA was the ancestor to the present day Friends of GRparks. “The Puritian Sunday is now a thing of the past,” said Lester J. Rindge, the father of the GRPBA. “Working men demand more recreation than formerly and they must be provided with places where they can rest and enjoy the open air and for this reason, if for no other, more parks and boulevards must be provided.” The green space initiatives in the city gave rise to a new era of parks such as Garfield and Riverside. Charles W. Garfield, president of the Grand Rapids Savings Bank and the Michigan Forestry Commission, had been a long time advocate across the state for green space development. He was also the treasurer of the GRPBA and in 1906, he and his wife deeded some of their land to the city to start the Garfield-Flecher playground on the corner of Madison and Burton. The land that became Burton Heights originally was part of the 320 acre Burton Farm. Eventually, Garfield bought a part of the farm and planted 10 varieties of trees to develop it into woodland that was later called the Burton Woods. In 1918, he gave the wooded area, west of the playground, to the city which expanded the park an additional 15 acres. In 1934, Garfield’s remains were buried in the park under a large boulder featuring a plaque that can still be seen today. In 1948, a park improvement program in the city led to the development of a swimming facility. In the 1960s, the city tried to parcel out the woods for residential development but thanks to the residents of the neighborhood organizing, the Burton Woods became the Garfield Nature Center. Other prominent land donors included Clara Comstock Russell and Etta Comstock Boltwood donating 40 acres of swamp land south of their home which sat on the east bank of the Grand River to the city. In 1917, the city purchased 50 acres east of the donated land and later 13 acres south in 1922. In 1923, the city purchased a dredge to create lagoons and raised the elevation of land by three feet. These efforts lead to the 1929 opening of Comstock-Riverside Park. The park’s landscape continued to be developed in the 1930’s. In July 1931, the city opened one of the finest municipal tourist camps in the U.S. at that time in this park. The camp offered campsites and cabins for rent along with a boat and canoe club. In 1946, the declines in tourism led to the camp being closed. Recreation continued to evolve during the first half the 20th century in Grand Rapids. In 1917, the Michigan legislature passed Public Act 1917 that enabled cities to develop and operate systems of public recreation and playgrounds. By the early 1920s Grand Rapids Park acreage had risen from 450 to 1,214 acres. 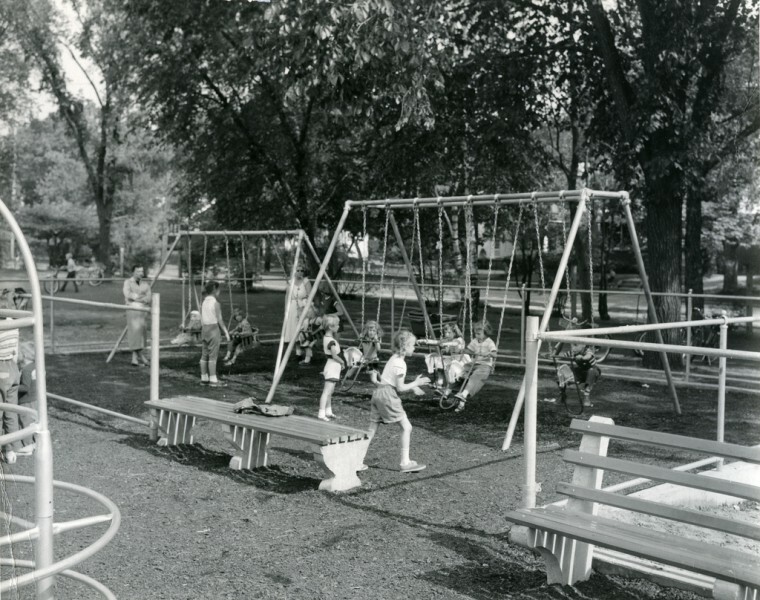 In 1951, The City of Grand Rapids and Grand Rapids Public schools entered into a partnership that led to the joint development and use of park-school facilities in areas that would serve the needs of the residents who utilized the parks and students. The 1960s saw the era of “White Flight” in the city. This was a period that brought about a mass exodus of residents, predominantly of European ancestry, from the city to the developing suburbs. This decade also saw the development of our current freeway system which destroyed whole neighborhoods in the city essentially cutting it into pieces. Emphasis on urban development in Grand Rapids decreased greatly which led to a period of urban decay and a de-evolution of urban green space planning. This brought with it drastic cuts to the Parks and Recreation Department over the next 50 years. It’s obvious that the forefathers and the planners of our city put parks at a high priority level. The precedent is set to take care of our urban green spaces. Why have we now gone against our own history in the past 50 years? Can we return to this best practice? I will speak more of the ways our parks affect us and why they should once again be a priority in my second part of this series of articles. My name is Michael Tuffelmire. I was born and raised in downtown Grand Rapids. I am a father, decorated veteran and community advocate on issues of community violence, smarter government, and neighborhood revitalization. I am a community organizer and Aquinas graduate with a Masters of Management. I am set to graduate from Aquinas with my Masters of Sustainable Business in 2014. I have been writing for the Rapidian since its infancy in October 2009 and received the 2010 Volunteer of the Year award from the Community Media Center for my writing â an honor for which I am extremely proud. My hobbies include bicycling, camping, paddling, historic preservation, travel, reading, and enjoying the sights and sounds of the city.